Were you looking for the book with access to MyMathLab Global? This product is the book alone and does NOT come with access to MyMathLab Global. 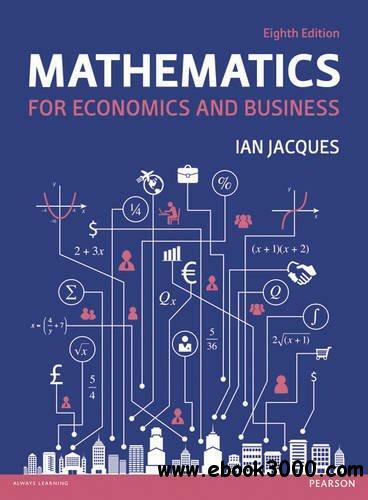 Buy Mathematics for Economics and Business, 8th edition with MyMathLab Global access card (ISBN 9781292074337) if you need access to MyMathLab Global as well, and save money on this resource. You will also need a course ID from your instructor to access MyMathLab Global. If you want to increase your confidence in mathematics then look no further! Assuming little prior knowledge, this market-leading text is a great companion for those who have not studied mathematics in depth before. Breaking topics down into short sections makes each new technique you learn seem less daunting. This book promotes self-paced learning and study, as students are encouraged to stop and check their understanding along the way by working through practice problems. FEATURES * Many worked examples and business related problems. * Core exercises now have additional questions, with more challenging problems in starred exercises which allow for more effective exam preparation. * Answers to every question are given in the back of the book, encouraging students to assess their own progress and understanding. * Wide-ranging topic coverage suitable for all students studying for an Economics or Business degree.